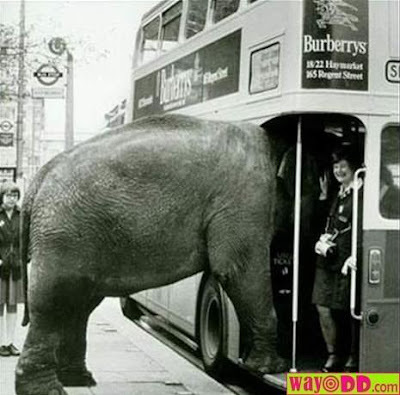 Did you hear the one about the elephant on a double-decker bus? No? Tusk, tusk, tusk. Okay that was really bad. But YOU can come up with a better one (or worse, depending on your point of view). This is the pic for this week's caption contest. Good luck folks. The winner will be announced Saturday. Oh and visit my award-giving humour blogger buddies the captivating Kirsten at The Soccer Mom Files and the ever enchanting Ettarose at Sanity on Edge if you've still got a hankering for captioning! Oi you git! Where's my pint!? Pack this you tub of derm! Even the animals are going berserk in Britney Spears Circus tour. Sorry old boy, but we have no room for your trunk. "whaddya mean i gotta pay for two seats?" what no space in the trunk...lol.